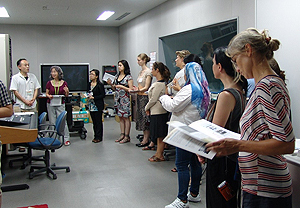 Presenters discussed the piece with personnel of the Department of Art Research, Archives, and Information Systems. Presentations covered a range of topics, including reports on the restoration, analysis of the piece based on surveys, and re-examination of points raised during presentations. Multiple researchers investigated a single work from multiple perspectives. Such an approach is unprecedented in the study of modern Japanese-style painting, making the conference a groundbreaking event. Plans are to summarize the results in volume 6 of the Archive of Art Studies (published by the Institute) for publication next spring. 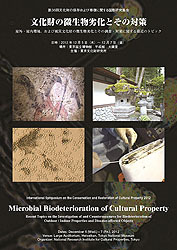 Degradation by microorganisms significantly affects cultural properties, regardless of whether they are indoors or outdoors. 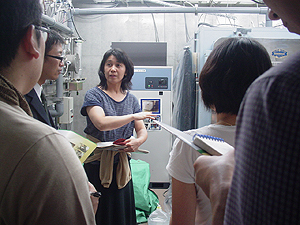 In addition, cultural properties that have been damaged by an earthquake, tsunami, or other natural disaster are soon susceptible to biodegradation due to water damage. Surveys of the extent of damage and steps to combat it are vital. 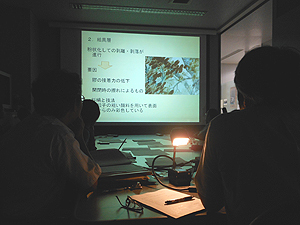 The National Research Institute for Cultural Properties, Tokyo will hold an International Symposium on the Conservation and Restoration of Cultural Property on Dec. 5 (Wed.)–7 (Fri.), 2012 in Heiseikan of the Tokyo National Museum. In addition to guest lectures, the symposium will feature 22 poster presentations on biodegradation of cultural properties and steps to counter it. 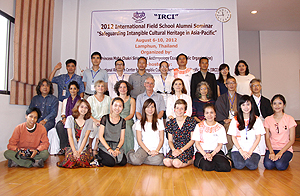 The symposium provides a forum for active discussion and exchange of information by domestic and foreign researchers and individuals who work with cultural properties, so numerous attendees are expected, including individuals involved in the protection of cultural properties, researchers, and students interested in the area of cultural properties. Applications will be accepted until Oct. 20th. For details, see http://www.tobunken.go.jp/~hozon/sympo2012/. Please direct inquiries to sympo2012@tobunken.go.jp. 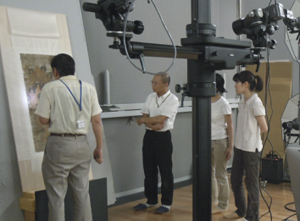 We have been performing restoration on the “Twenty-Five Bodhisattvas Descending from Heaven” (Kimbell Art Museum, Fort Worth, United States) since 2011 as Cooperative Program for the Conservation of Japanese Art Objects Overseas. This is a pair of hanging scrolls, color on silk thought to have been executed in the 14th century. All of the bodhisattvas are gold-painted and, delicate decrative pattern of gold foil applied to them, but the paintings have begun to appear dark due to the filth of aging, and a problem for conservation arose from the glue becoming loose all over the place. During this restoration, we are going to dismantle the scrolls and renew the mountaining . At present, the removal of the old first lining paper of the light scroll compretely. We can verify the ink lines of the underlying sketch and the backside coloring by looking at the other side of the silk , and we took color and near-infrared photographs to perform the required investigation for its restoration. The bodhisattvas are presented with noble features when looking at the surface of the work, but we could confirm the existence of an excellent underlying sketch with calm expressions throughout the entire work because of the gentle line drawing on the backside in comparison to the quite solid line drawing on the surface by verifying it with a near-infrared image. In addition, we were able to confirm that the backside coloring was applied as a traditional Buddhist painting colored with white and green paints from the backside of the silk canvas. These types of images can only be verified when doing a dismantling repair. We could proceed with an even safer restoration by recording both surface and the backside of the work with high-resolution pictures, and we will utilize these images as research materials in the future. We would like to continue future work while increasing consultations with the curator of the museum that own Japanese cultural properties.